Imagine a much-loved little girl waltzing around with her mother’s hats, scarves and stoles. Imagine her mother’s delight in dressing her up for a party. Now imagine that this mother is a couturier designer with one of Spain’s most prestigious houses – Balenciaga. The little girl grew up to be one of the great talents in the world of eyewear design: Fabienne Coudray-Meisel, creator of the Volte Face brand and a partner with the illustrious J.F. Rey. The new frame designs draw their inspiration from many sources, notes Coudray-Meisel. From the architectural mobile sculptures of the late American artist Alexander Calder to the ‘witches mirror’ or ‘miroir de sorcière’ of French designer Chaty Vallauris, to industrial panels and glass vases from Murano, Italy, the world is chock-full of designs that speak to Coudray-Meisel who will stop at nothing to translate her dreams into reality. “I want people to say ‘wow’ when they see the frames and ‘wow’ again when they put them on,” she says. Laser engraving is one outstanding surface finish you’ll see on acetate front temples to dazzling effect, with geographic patterns and criss-crossing lines and circles in the Templa, Tildia, Tyler and Twig models. Sculptural, tiered, petal-like pieces are layered on the Urika for a subtle, elegant effect. And luxurious jewelry is recalled in the minimalist, yet sophisticated Usuki and similar models, with laser technology leaving slight variations in the acetate. Fluid lines, structural contract, surprising patinas and astute use of colour all combine to create a je ne sais quoi that is worthy of the ‘wow factor’ Coudray-Meisel aspires to. Sarah Braida will be rolling out the new Volte Face collection with a Quebec start this spring, to a country-wide hello into the autumn. “We’ll be receiving the models from the MIDO and VEE shows soon. The final pieces will be unveiled at Silmo in September, and Volte Face will be seen at retailers as soon as possible thereafter,” says Braida. 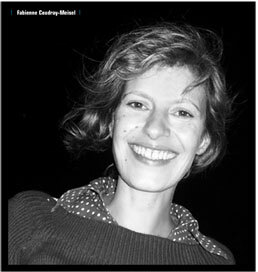 One sad note in the life of Fabienne Coudray-Meisel, is that her beloved mother passed away when Fabienne was still a child. But the positive life force of the child, Fabienne, grew and flourished and she is now an influential designer in her own right. Now imagine Fabienne Coudray-Meisel living a long and rich life, creating beautiful objects for the world. And dancing with her daughter.